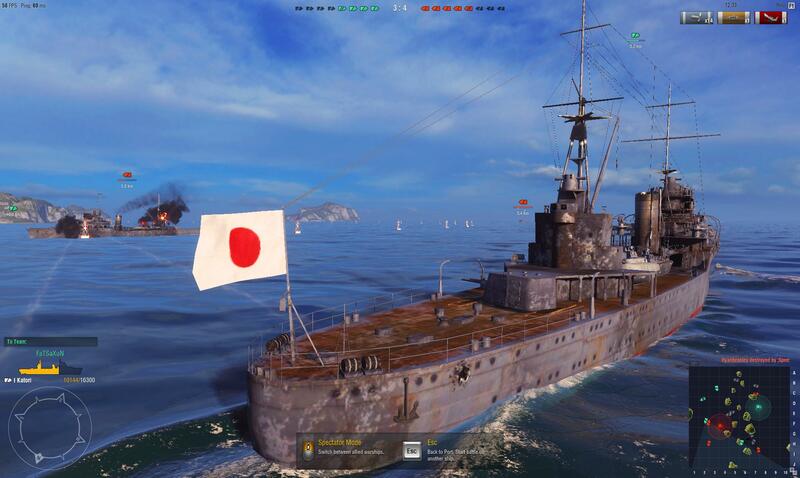 World of Warships is crazy fun! Currently in closed beta from the same company that makes World of Tanks and World of Warplanes, Warships brings the same style of gaming to the oceans. 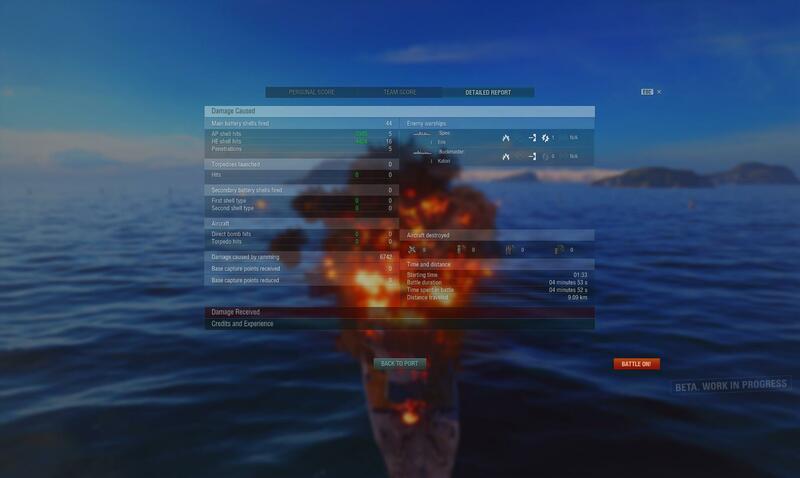 As a relative noob to all their games, I’ve been whooshing about in cruisers and destroyers for the past week, shooting ships and laughing maniacally. At first glance, it’s incredibly intimidating. You start out in your shipyard, which is basically a list of all the ships you have. You can poke about the tech tree with its list of incomprehensible names, or have a look at ship upgrades with their list of incomprehensible parts. Playing with a press account provided by Wargaming, I had my choice of ships to take for a spin, along with a huge pile of currency to buy whatever ships or upgrades took my fancy and not a clue what to spend it on. Instead, I grabbed a fairly low-level ship so as to not embarrass myself and took to the ocean. Once you’re in the water, everything becomes clear. The loading screen gives you helpful instructions on what the current mission is (generally kill everyone on the opposing team or capture a base) as well as a one-sentence overview of what your ship class’s job is. For cruisers, you’re there to fire missiles at at other small ships. For destroyers, lay down the smokescreen to hide your team’s ships from aircraft, and use missiles or torpedoes to take out the enemy. I’ve not been brave enough to take bigger ones for a spin yet but I’ve seen the odd aircraft carrier coasting by on the battlefield. Since you’re in a whacking great big ship, the game starts at a fairly sedate pace. You don’t have to worry about having the fastest reactions or the keenest eyesight. 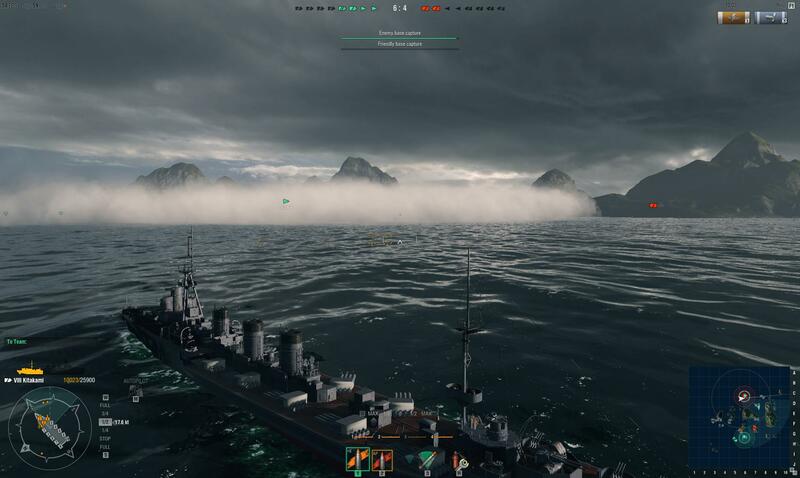 World of Warships is all about tactics. Sure, you’ll be barrelling towards the other side of the map in peace but be mindful of where you’re going and who’s nearby. Don’t get separated from your group or you’ll be an easy target for just two or three ships. Try not to face your opponents broadside as they’ll have a much easier time hitting you. Watch where you’re going or you’ll get stuck on one of the many islands dotted about the map. And for god’s sake, don’t cut in front of your team-mates. Ramming speed is a dangerous thing. It can all be over in less than a minute once you actually see the enemy. Battleships are not known for their manoeuvrability. Fortunately, missiles take a while to reach you and if you keep your eyes open, you can turn into and slip between waves of torpedoes as they approach. 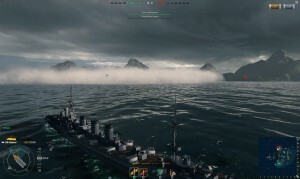 Sheltering behind islands can also make you harder to hit from a distance. Sometimes you can fool an enemy by varying your speed or approach but generally, you want to rove in packs and kill the other bugger before s/he kills you. At least, that’s how I play. It’s not clever but it works. Other ships are clearly marked with HUD elements from a distance, so all you need to do is zoom in and fire. Watch where your missiles land, adjust accordingly and try again. It takes time for your turrets to move into position, so can feel like slow going. Pay attention though, as you can easily find that you’ve sailed right into the opposing faction while aiming, or that other ships launched a bunch of torpedoes up your arse while you were looking the other way. I’m working on actually recognising other ships by sight, as the HUD doesn’t provide any detail on what you’re actually up against. I’m also slowly learning about the various upgrades and the most efficient ways to spend my money. Mostly though, I’m tooling about in the water having a blast. World of Warships is currently in closed beta on Windows PC.